1st/2nd Gen DSM ProStreet Turbo Manifold. This BOTTOM MOUNT 4G63 manifold is for the 1st and 2nd gen DSM/Eclipse. When compared to a cast/log style manifold, we have seen gains of at least 50+whp at lower boost levels with our manifolds. Designed to perform, this piece will support a great deal of power! - Manifolds are CAD/CFD designed. 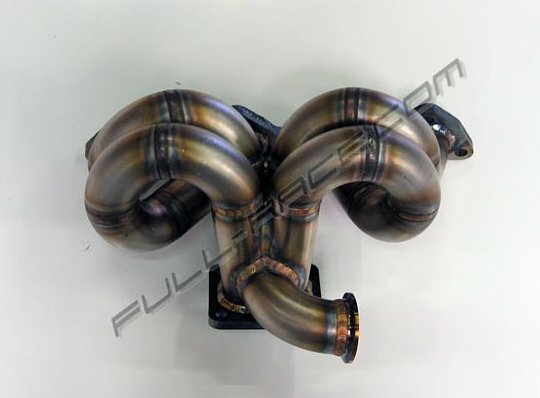 - Manifolds are fabricated from 8 gauge forged stainless steel. - Flanges are machined flat ensuring leak free seals. - Robotic TIG welding for ulimate strength and longevity. - Choice of either T3 or T4 sized turbine flanges. - Wastegate flanged for TiAL 44mm only. - Turbocharger placement allows use of air intakes even on T04S style compressor housings. Placement also allows use of large radii 3.0 in. downpipes. - Upper radiator hose must be modified in order to clear the runners on the manifold. - A/C and PS compatible!